Former Jonas Brothers member Nick Jonas performed on the Hilltop Sept. 30. 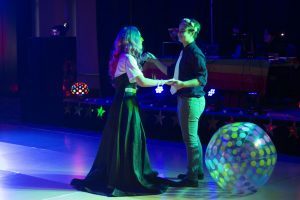 The concert was hosted by Activities Council of Bradley University, and featured over 2,000 tickets were sold for the singer of “Jealous” and “Chains.” Singer-songwriter Skylar Grey opened the show. The Bradley community was devastated when a shooting took place April 8 at 1821 W. Bradley Ave., just a few blocks away from campus. Freshman biomedical science (pre-med) major Nasjay Murry was killed during the shooting. Peoria native Anthony Polnitz was also shot and killed and another Bradley student suffered a gunshot wound to the hand. Peoria Police Department arrested suspect Jermontay Brock, 16, of Peoria April 11 and charged him with the murder of Polnitz. Brock was charged with double homicide April 24. Baker Hall, longtime home to the Foster College of Business, was demolished in the spring of 2017 to make way for the new Business and Engineering Complex. The structure will cost Bradley approximately $120 million to build, and will feature offices, classrooms and labs. Displaced faculty and business students are currently taking classes in academic buildings across campus, and the business college has been temporarily relocated to Campustown. Jobst Hall will be torn down in the fall of 2019. Last semester, Bradley began installing all-gender bathrooms in various residence halls across campus. The initiative installed 30 all-gender restrooms at the university. This comes as part of Bradley’s increased efforts to be more inclusive of different gender identities. Last year, the pronoun resolution was passed, allowing students to choose their preferred pronouns on Webster and Sakai. This coming fall, Wyckoff Hall will also implement an open housing floor designated as a living space for students of all gender identities. However, a gender inclusive housing resolution that would allow transgender students to live in dorms as the gender they identify as was recently proposed in Student Senate, but failed to receive the two-thirds majority vote it needed to continue to University Senate. On Nov. 1, renowned television and radio show host Larry King announced he would donate $1 million to Bradley’s communication department. This announcement came in advance of King’s visit to campus on Nov. 7 for the third annual Charley Steiner Symposium for Sports Communication, where he took part in various panels regarding media practices. The last time both Los Angeles Dodgers broadcaster Charley Steiner and King participated was in the inaugural event in 2015. After years of deliberating, rewriting and voting, University Senate passed the Smoke-Free Campus resolution Oct. 19. Originally, the resolution started as a referendum during the spring 2016 student body elections as a way to gauge student interest, but discussion surrounding the topic has been ongoing since 2014. As is written in the resolution, smoking will be completely prohibited on Bradley’s campus, including all academic and residence halls, greek houses and all public property of Bradley University. Additionally, promotion of smoking and tobacco products through any campus organization, activity or media is prohibited. 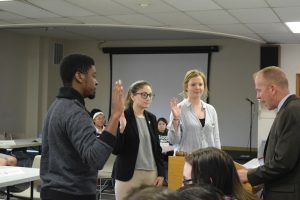 While the resolution has officially passed through University Senate, students can expect an extended waiting period while Bradley’s Administrative Council designs an implementation program detailing how the university will promote, carry out and enforce the resolution. Although u.Achieve and Bradley’s former system Degree Audit Report (DARS) operated simultaneously since the fall semester of 2016, u.Achieve officially replaced DARS in mid-October. DARS held familiarity to the entire Bradley staff, being used for nearly two decades, with its inception at Bradley in the late ‘90s. The Bradley men’s basketball team finished the season with 20 wins for the first time since the 2008-2009 season. They also advanced to the semi-finals in the MVC Tournament. Sophomore point guard Darrell Brown led the team with 13.5 points per game, and senior Donte Thomas finished his career on a high note. The outlook for the future is bright, as well, as the Braves will return 83.5 percent of their minutes. A record number of 10,232 students applied to Bradley for the fall 2017 semester. According to Justin Ball, vice president of enrollment management, this year’s freshman class clocked in at just over 1,200 students, up from the 2016-2017 academic year’s 1093 freshman class. Additionally, the transfer student rate climbed this year: up to 272, while last year saw 234 transfer students. In an article that ran in The Scout on Sept. 1, 2017, Ball said freshman enrollment for 2018 is expected to be between 1080 and 1120, while transfer students are expected to be around 205 and 215. Bradley University Police Department teamed up with Kaboom! this semester to bring attention to Bradley’s growing issue with jaywalking. Throughout the month of March, Bradley students saw Kaboom! dressed in a crossing guard uniform directing pedestrians at the Campustown intersection. BUPD began and continues to ticket students for jaywalking at multiple locations around campus.